“An Autobiographical Sketch of Neil R. Jones” originally appeared in the January, 1937 issue of Fantasy Magazine . 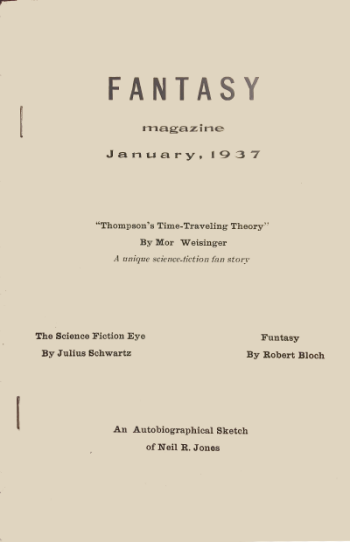 Fantasy Magazine began life as The Time Traveler in January, 1932; the work of Julius Schwartz, Mort Weisinger, Allen Glasser and Forrest J. Ackerman and considered to be the first true science fiction fanzine. In September, 1932, The Time Traveler was incorporated into Science Fiction Digest , which then became, in January, 1934, Fantasy Magazine . In addition to those previously named, Maurice Z. Ingher, Conrad Ruppert and Raymond Palmer are connected to the latter two titles, but it is not quite clear exactly who did what (the title of “Editor” appears to have been given to most anyone who worked on the magazines). What is documented, however, is that from the first issue of Science Fiction Digest through the final issue of Fantasy Magazine , each issue featured fiction, articles, commentary and interviews or autobiographies of prominent science fiction authors of the day (one of the most amusing I found listed was an interview with Murray Leinster conducted by Will F. Jenkins...Jenkins being Leinster’s real name). It appears that Schwartz pretty much ran the magazine on his own in 1936 (Weisinger became an editor at Thrilling Wonder Stories in 1936) and finally cancelled Fantasy Magazine in order to devote his time to Solar Sales Service, the science fiction literary agency he and Weisinger had founded 1934. The final issue was dated January, 1937, which brings us back to Neil R. Jones. Jones addresses a large number of topics in this sketch and of particular interest are the sections where he describes his writing process. Jones was not a particularly fast, or diligent writer (as were some of his contemporaries) and one point he seems to skip within this autobiography is just how he makes a living, or what he does with his spare time, other than hobbies. There is, however, a sizable amount of information about his different story settings and even at this early age, he had his future history already laid out. He is also a keen observer of the current science fiction magazines themselves and is obviously both a fan and professional. Special mention must be made of The Outlawed World . Although it appears that Jones had finished it by late 1936, it remained unpublished until 1951, when it finally saw print in the Summer, 1951 issue of Two Complete Science-Adventure Books under the title Citadel in Space . It has never been reprinted as of this writing. In the section where Jones talks about artists, the names mentioned may not be familiar. “Paul” is Frank R. Paul, who was one of the premiere illustrators of science fiction from the 1920s into the 1950s. Dold is Elliott Dold, Jr. (who also signed his work as Elliott Dold or just Dold), an active illustrator in the 30s, mainly for Astounding . “Cosmos” was a 17 chapter round-robin novel that began in the July, 1933 issue of Science Fiction Digest , continued through the name change to Fantasy Magazine and concluded in March, 1934. Far more than a fan project, each chapter of “Cosmos” was written by one of the “name” authors of the day and bound into the magazine as a separate supplement (sort of like a chapbook). And, while Fantasy Magazine would later publish two round-robin stories in 1935, the length, and authors involved, made “Cosmos” a rarity that had never been attempted before. “Cosmos” would most likely have been relegated to footnotes in science fiction histories and such were it not for “The Cosmos Project.” The work of David Ritter, the site reprints all 17 chapters of the Cosmos novel in their entirety and David has done a great deal of research into the creation of the novel—enhancing his presentation with a wealth of background and reference materials. Fortunately, in addition to being a diligent researcher, David is also a nice individual. As I was reading through his site, I noticed a mention that he had a full set of Science Fiction Digest and Fantasy Magazine . I screwed up my courage and dropped David an email, explaining the FAFF site and asking if he would have the time to scan the Jones sketch. The pages arrived in a short amount of time and so, we offer a big thank you to David for his kind assistance. Be sure to stop by “The Cosmos Project”...you’ll be gald you did! We have inserted drop caps and spacing between some sections where Jones changed topics, to help break up the page layout (giant blocks of text just don’t work on the Internet). There seems to have been two editorial hands at work in the sketch—one who correctly italicizes magazine titles and one who puts them in quotes. We have chosen to display all magazine titles in italics. We have retained all spelling and punctuation, except for one reference to Edgar Rice Burroughs, in which his last name was misspelled “Boroughs” (this occurred in the section where Jones is talking about his favorite authors). MY AGE is 27, and I live in a small city not very many miles from Lake Ontario. No, I’m not married. I have a business education, but I've done no bookeeping since I left high school; just writing. The manner in which I have written science fiction has been a despair to the editors. I always consider them last. I was a reader of science fiction before ever being a writer of it, and I always write from that standpoint. First of all, it must suit Neil; then the readers at large; and if the editors like it, the story gets into print. I have been known to write odd lengths, disregard editorial taboos, fail to keep in a slant and violate set policies in general among other iniquities. “The Jameson Satellite”, the first of the Professor Jameson Series was one of such stories. It was rejected by three editors before it found sanctuary at Amazing Stories , and a shade of doubt may have existed there, too, for out of six stories in that issue it was the only one not forecasted in the previous issue. It was just slipped in unobtrusively, but the editorial choice was warmly vindicated, and since then the professor’s fame has grown. To date, Amazing Stories has accepted thirteen stories of this series of which nine have been published. I have never yet had one rejected, and I have never offered any of this series to any other magazine since the acceptance of “The Jameson Satellite”. I have been given all latitude and liberty in the matter of writing this series. They can be any length. I have tried all sorts of unique experiences and ideas of narration in recounting the professor’s adventures, finding the reflection of the readers in “Discussions” one of favorable approbation. This passive attitude of the editorial staff is largely responsible for the success of the series, and just as long as this remains so the professor will use this pioneer magazine of science fiction as his gathering spot to tell what has happened among the machine men. How long will the professor continue his adventures with the machine men? Just as long as nothing happens to him. He almost jumped to a suicidal death in that first story. A thought stayed him. He is not always careful, either, as you probably learned. As long as readers do not tire of his escapades, he shall continue to present the most interesting of his various adventures from world to world, from system to system. After all, the readers are the true power if they only care to wield this power and insist upon their prerogatives. Editors and authors both depend on them-and owners of the magazines too. The clamor of the majority must be met; and wherever those of the minority can be satisfied to the indiference of the rest, this, too, should be given careful consideration. To varying degrees, however, especially in regards to mechanical features of the magazines, editors are more or less bound and gagged by ownership policy. This is a shot in the dark, yet I imagine that it is so. Editors, like managers of baseball teams, should be given a free hand as long as they produce. Amazing Stories costs too much. It is too bad that this grand old patriarch of science fiction is down on a bimonthly basis. I was reading Amazing Stories before I ever started writing science fiction. The magazine needs more variety in artists, too. Thrilling Wonder Stories , with the well-known, strong backing it has as one of the “Thrilling” group should bolster up its courage and come out as a monthly instead of appearing but once in two months. It was a happy day when they took over this magazine. The editor is doing very well. The first two issues have brought out the names of prominent science fiction authors we have not seen in the science fiction magazines for a long time. Nothing much seems to be wrong with Astounding Stories at present. It was a wise move of theirs in putting smooth edges on the magazine and goes to emphasize what I said about pleasing majorities and minorities. Paul is the best illustrator. The work he did for my story, “The Asteroid of Death” in the 1931 Fall issue of Wonder Stories Quarterly was a masterpiece. He seems to show the best imagination and attention to detail of any science fiction artists I have yet see, and his draftsmanship is faultless. Dold is very good, too. I was well pleased with his illustrations for “Little Hercules”. In their concerted rush for new science fiction ideas, the editors should not overlook features of unique presentation and variety in style. There’s a dull, deadening influence in reading science fiction done m the same old song and dance way even if the science in it is strickingly original or the plot slightly altered. Readers will turn to other forms of reading or entertainment and they have, too. Three out of four science fiction magazines are running on half time. Editors call for new stuff and in the same breath say, “don't forget the slant.” That slant can become tiresome to a reader. Editors change their policies right about face from time to time, especially so in a panic when their circulation commences to drop. What they should do is employ a broader policy. INVARIABLY I am asked how I go about writing science fiction. Whenever the general idea for a story strikes me, I stick a tentative title in a notebook and give it fifty or a hundred words of explanation for revival of my memory and inspiration. I may do the story soon; again, it may lay untouched for years. When I do get around to write it, I do a bit of action outline for it on a typewritten sheet and then set to work. I never outline very far ahead and then only a vague, general idea which I often times wander away from or change. I rarely know how a story is going to come out when I sit down to write it. It is much more interesting to let it write itself. Like yourself, for instance. Do you generally know what is going to happen to you when you start out for a destination? You have no exact idea. If you did, you would probably be bored. I do the story first in longhand. I rarely work more than three hours a day, and not every day at that. I depend solely on mood. Forcing myself is invariably useless. When my manuscript is all done in pen and ink, I cut it into chapters and name them. Then I typewrite the story. It has been suggested to me that I type it the first time, but I find deeper concentration when I use a pen and am not bothered with mechanical features of a typewriter, although I use the touch system. I type my story very slowly, about as slow as I wrote it, for at this stage it is being polished and rewritten. When it is finished, I go over it with a pen for typographical errors and slight revisionments. On an average, I spend about an hour on every five hundred words. When I am going good, the story comes as fast as I can write it. The Professor Jameson series goes exclusively to Amazing Stories . Besides the various odd stories I have written, including “The Electrical Man” in Scientific Detective Monthly , “Suicide Durkee's Last Ride” in Amazing Stories , “Exodus” soon to appear in Thrilling Wonder Stories , etc., I keep two other series going. Under “Tales of the 26th Century”, you have read “The Death's Head Meteor" in Air Wonder Stories , “The Asteroid of Death” in Wonder Stories Quarterly , “The Moon Pirates” in Amazing Stories and “Little Hercules” in Astounding Stories . My third series, “Tales of the 24th Century”, has been represented by such stories as “Spacewrecked on Venus” in Wonder Stories Quarterly and “Escape from Phobos” in Wonder Stories . Paradoxically, in view of the fact that I write of the future, my reading matter consists chiefly of the past centuries in fiction I find a reflection of the future in the past. Human nature and the ways of group civilization evolutionize very slowly in contrast to our swift mechanical and scientific trend. My favorite authors are Victor Hugo, Alexandre Dumas, H. Rider Haggard, Vincente Blasco Ibanez, H. G. Wells and Jules Verne. I also like Jeffery Farnol, Rafael Sabitani. Arthur Conan Doyle, Edgar Rice Burroughs, Zane Grey and Edgar Wallace. I don’t care so much for Poe; he is too consistently depressing. Burroughs was my inspiration, and I still look up to his older publications, but of late he has gone distressingly juvenile and does hack writing. What science fiction should strive for now is literary value. Editors should not frown on this, for the readers do appreciate it more than the editors perhaps realize. My own favorite science fiction story has not yet been placed, and it is quite possible that readers will not see it until it reaches book form, for it is a 93,000 word novel, “The Outlawed World”, from “Tales of the 26th Century”, and editors shy at handling this long length serially. This was just recently written. When you come to consider that most of the serials run to convenient lengths of 60,000 words, it remains to be seen whether an editor will care to run four 23,000 word installments. I dreamed this novel for five years. The earth circled half its orbit while I was writing it. The green and gold of summer yielded to the gray and white of December before it was finished. In short, I shot the works on this story, giving it everything I had. It is my best, my longest and my favorite, “The Outlawed World”. Love, humor and tragedy walk in trinity against the scientific background of a turbulent 26th Century, especially those closing years. Despite its unusual length, there’s not a dull moment in the entire novel. You have already met two of the subsidiary characters in Astounding Stories . They are Grimo the dwarf and Aonis, the product of the Durna Rangue in their search for a synthetic vampire; if you have read “Little Hercules”. Gene Trenton, the main character, you have never met, but you knew his father of a generation earlier. Jan Trenton rode the tiny space flyer in his encounter with “The Death's Head Meteor”. Darker shades fall across the dominate Asurians and their strong-arm minions, the space pirates. Lindquist, the lone space pirate, will thrill your imaginations to a new tempo, and there are a host of other interesting characters as well. THIS is becoming overly long despite the fact that Mr. Schwartz gave me full rein. So far, all I've talked about is writing, and this is supposed to be an autobiography. What do I do with my leisure? I swim a good share of the time during the summer. There is a large river and two lakes handy. I am qualified as a life-guard. I play baseball, too. In the winter I ski and play basketball. An all year round occupation of mine is book-binding. Science fiction magazines, of course. I used to collect stamps, but that hobby, aside from my occasional buying of new centennial issues, lays dormant. It probably goes without saying that I am interested in astronomy, what I read rather than what I can see. That huge telescope eye will prove an extensive source of information when they get it prepared and set up. What does science fiction need most? It needs vigorous business management, pushing and advertising, price within reasonable grasp of the buying public. Science fiction is in competition with a host of other publications selling at ten to fifteen cents. I’ve talked with proprietors where these magazines are sold; I've talked with one-time readers who, becoming a bit tired of science fiction, have yielded to the lure of lower-priced detective and adventure fiction. A high price discourages new readers from trying it. People invariably ask me when I am having a new story out, I tell them, but when they find that the magazine costs in the neighborhood of a quarter of a dollar their interest cools. There should be more faith and venture on the part of the owners. Fast nickels are better than slow dimes, and I understand that advertising rates are automatically boosted with circulation. Advertising in other types of publications with an offer of a free sample back number (an especially-appealing, well-rounded, back number) would probably more than return the cost of such advertising. Attractive subscription offers help, too. Here is another phase of my writing which may, perhaps, be of interest. I keep a rather elaborate bookkeeping system of my stories in my Literary Journal. First, I have a day-book section with a record what I do in a literary way from day to day. Another section lists all my titles with each one numbered, its length, when I started and finished it, and which magazine, if any, accepted it with date of acceptance. Another department is devoted to a published list in regards to number, story, length, remuneration, magazine and month of issue. Then I keep various publication percentages based on stories written, total work lengths written and published, publication and acceptance against what I have written in stories and words, etc. It commences to get more technical from here on, so I shall avoid further mention of these records in percentages. My present percentage of sales against stories written is 71 and one-half percent. In other words, 28 and one-half percent of the stories I have written didn’t click for one reason or another, or else they are still going the rounds. These percentages are based on all time, including the first story I ever wrote which I sold. I keep also, of course, a record of the stories I send out with their numeral, magazine to which they are sent, date of submission and date of acceptance or rejection. AND now for a last minute secret. The idea of Professor Jameson’s interment in space was not evolved in my search for story material. 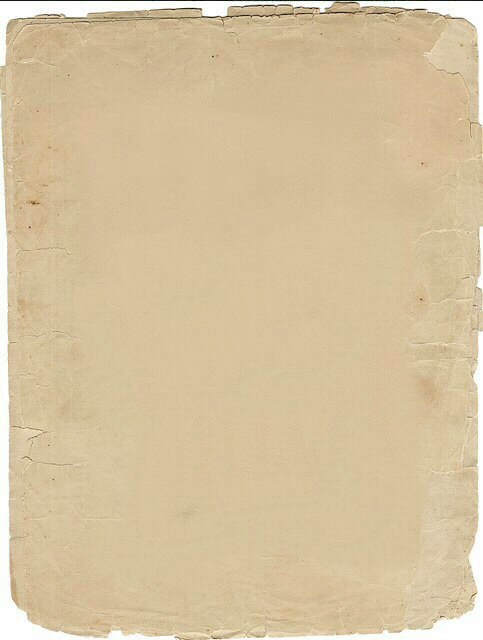 I considered this plan of the human body’s preservation as a sincere possibility several years before I commenced writing. I still do. A careful search of copyright records has shown that this article is in the Public Domain.